Geocache for your body, Waymark for your mind. On www.geocaching.com/seek and preferences are set to metric, the number box uses imperial anyway. 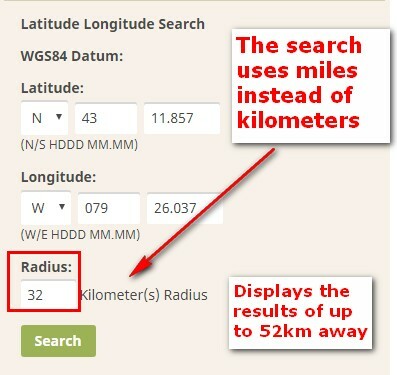 In the image attached I entered a set of coordinates and I wanted the metric amount of 32km. So I typed 32.... got results up to 52km away. 32 miles is 52km. Yes, that does seem to be the case. However, that page has been replaced by the newer search feature and will likely go away at some point, so they're probably not too worried about keeping it maintained.